The Producers, by the comedic genius Mel Brooks, was one of the Waterfront’s biggest hits, drawing huge numbers of tourists. 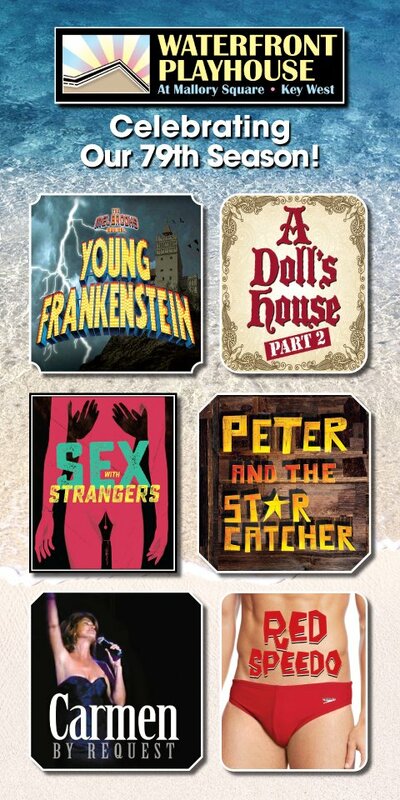 Next season we present Brooks’ follow-up to Producers – the stage version of his iconic parody of the horror film genre, Young Frankenstein. All the iconic characters are included: Dr. Frankenstein, Igor (or Eye-gor, as the character insists), Frau Blucher and of course, the Monster. The production will have a cast of 16 to perform such numbers as “Please Don’t Touch Me,” “He Vas My Boyfriend” and a huge production tap number of “Puttin’ On The Ritz.” This large and technically-challenging musical will build on the Waterfront’s reputation for giving these Broadway musicals a spectacular showing. We have already rented a costume package that is based on the original period designs. Mr. Brooks and director, Susan Stroman, have recently re-worked and streamlined the material for London’s West End, where the show is currently a huge smash hit. The Waterfront will adapt this new, critically-praised version. Would you do anything to win an Olympic medal? What is the line in the high stakes world of modern sports? This is the dilemma posed in Red Speedo, a razor-sharp play about whether doping is acceptable in the pursuit of that elusive medal – and more importantly, when commercial endorsements are at stake. This Off-Broadway hit by Lucas Hnath is about Ray – a young swimming phenom who has swum his way to the eve of the Olympic trials. If he makes the team, he’ll get a deal with Speedo, which means he’ll never need a real job. So when someone’s stash of performance-enhancing drugs is found in the locker room fridge, threatening the entire team’s Olympic fate, Ray has to crush the rumors or risk losing everything. This edge-of-your-seat play is about survival of the fittest, and the American dream of a level playing field—or of leveling the field yourself. The New York Times called the play “a taut, incisive drama…the characters are palpably, at times movingly, human in their complexity and weakness. A bitter indictment of our winning-at-all-costs culture.” The production will also feature an onstage working pool, which will add interest and appeal. We will open the 2018/19 season with Key West’s own Conch Diva, Carmen Rodriguez. Ms. Rodriguez has a proven track record of providing the Waterfront with sold-out houses in an evening of her incredible vocals. She plans to create an evening of her most requested songs by the likes of Carol King, Linda Ronstadt, Barbra Streisand, Patsy Cline, and many others.